Wash and chop baby corn in desired shape. Heat 1 tbsp oil and stir fry baby corn for 2-3 minutes. Remove from pan and keep aside. Now add rest of the ingredients except baby corn and mix well. 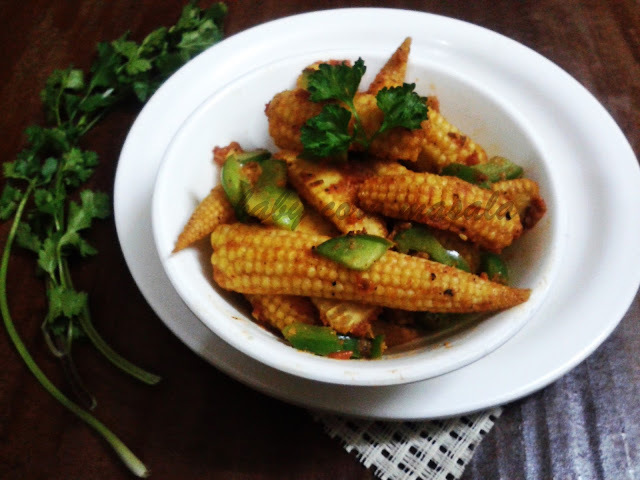 Add stir fried baby corn and mix gently till the masala coats the baby corn well. 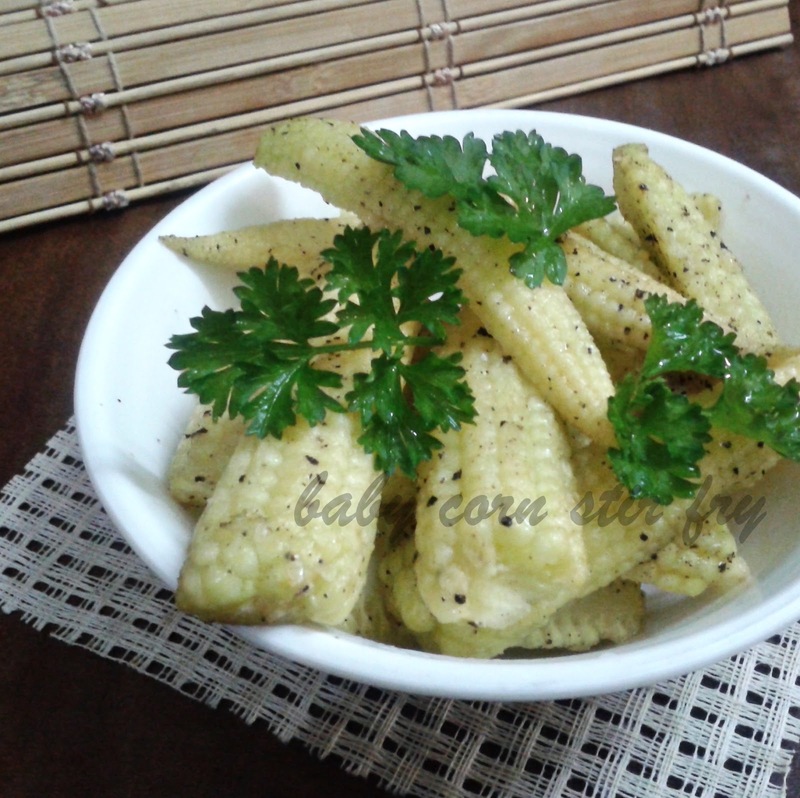 Wash baby corn thoroughly and put them in a strainer so that all the water drains out completely. If the corns are big in size then cut them in desired shape. Heat oil or butter in a pan and add baby corn and cook for 2-3 minutes on medium to high flame stirring intermittently. Add salt and pepper and stir again. For a tangy flavour you can add lemon juice after removing it from fire. Wash and chop broccoli into medium size florets. keep aside. Now add chopped broccoli,salt and turmeric powder and mix well. Simmer the gas and cook under lid till the broccoli becomes tender stirring occasionally. If required add a tbsp. of water. Cook further for 4-5 minutes till all the water present evaporates and all the spices coat broccoli well. 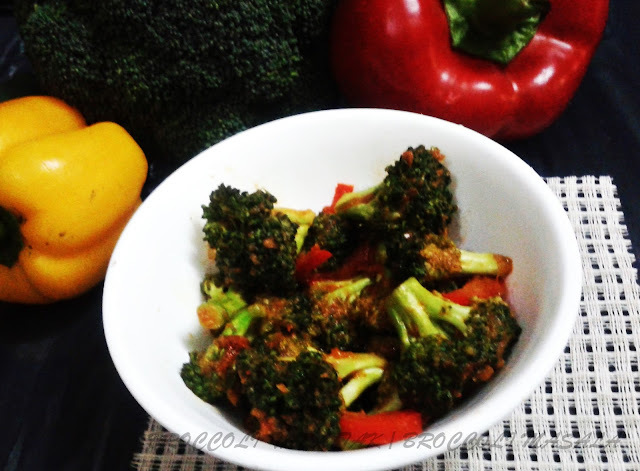 If you like you can stir fry broccoli in some oil and make a masala from rest of the ingredients and mix broccoli and masala afterwards. Cut the broccoli into bite-size florets and rinse them thoroughly. Keep them in a strainer till all the water is drained out so that they roast better in the oven. Then, in a large bowl, toss together the broccoli, garlic, olive oil, salt, and pepper. Spread out evenly in a single layer on a rimmed baking try. Spread grated cheese all over and bake it in the oven for 10-15 minutes or till the cheese melts or till the edges start getting brown. If you like you can add 1 tbsp bread crumbs over the grated cheese and then bake the broccoli.This will make it a bit crunchy. 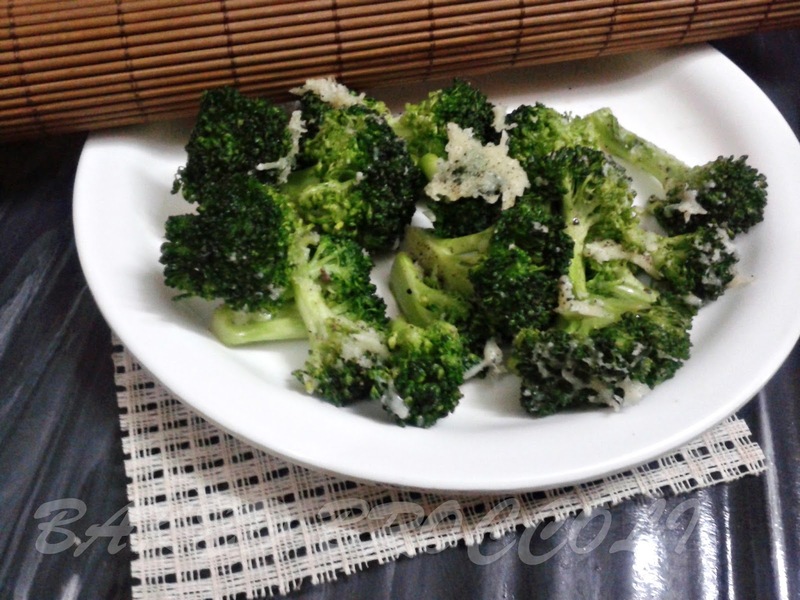 If you don't want to add cheese then roast broccoli without cheese and then you can drizzle a spoon full of lemon juice over the roasted broccoli. 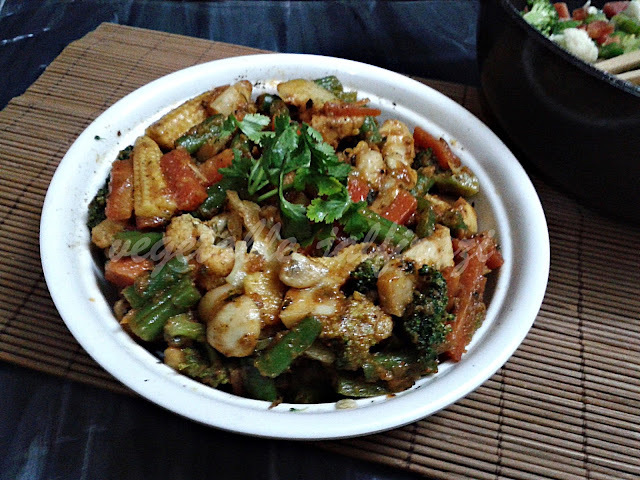 Heat 1 tbsp oil in a kadhai/pan and add sliced carrots, capsicum, cauliflower, baby corn,broccoli,mushrooms,beans and salt and stir fry it for 4-5 minutes on high flame while stirring continuously, then turn the flame on low, and cook the vegetables under lid till they become tender but still crunchy. Now remove veges on a bowl and keep aside. Heat remaining oil in the same kadhai, and crackle cumin seeds,then add asafoetida and chopped onion,garlic and ginger and stir fry till they become golden brown in color. Now add pureed tomatoes, salt and cook masala leaves the sides of the pan and leaves oil. Add 2 tbsp water and mix well. Add all the spices and ketchup and mix well. Now add all cooked veggies and mix well. Cook further for 2 minutes till all the spices coats the vegetables. Garnish with chopped coriander leaves and serve hot with chapati,naan or poori. 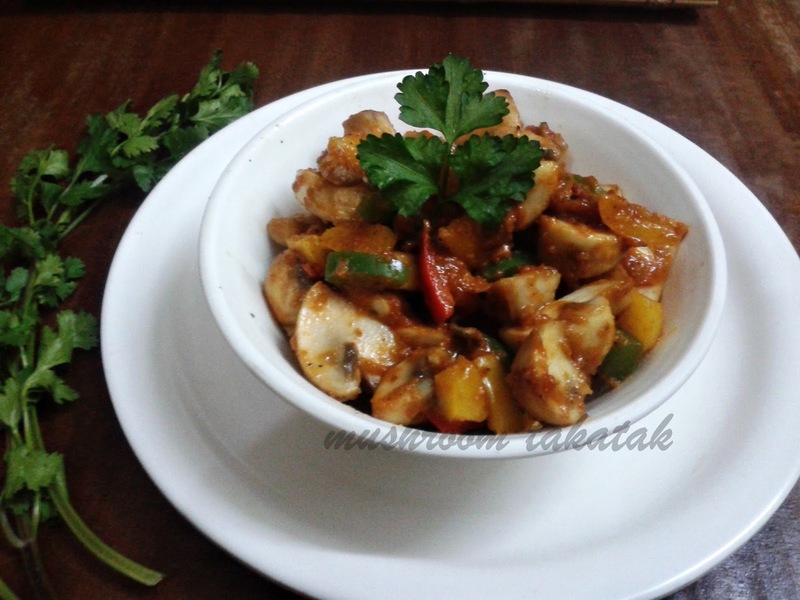 You can add cottage cheese along with veges in this recipe. You can choose the vegetables as per taste and availability. Clean and dry roast sesame seeds in pan. When they start changing color and you hear a crackling sound switch off the gas and keep them aside to cool. Now coarsely grind then in a grinder. Heat ghee in the pan and roast khoya in it till all the water evaporates and khoya stats changing colour and leaves the sides of the pan. 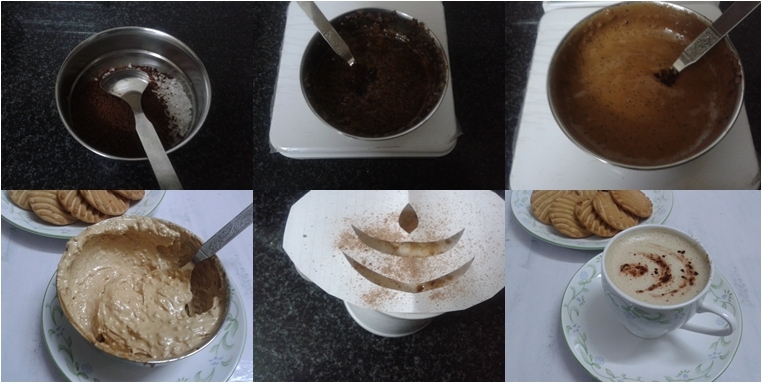 Now add ground sesame seeds,kaju tukda and bura sugar to it and mix well. Make small balls by pressing the mixture tightly with your hand. Then give them desired shape. Garnish with cashew nuts, raisin and pistachios. 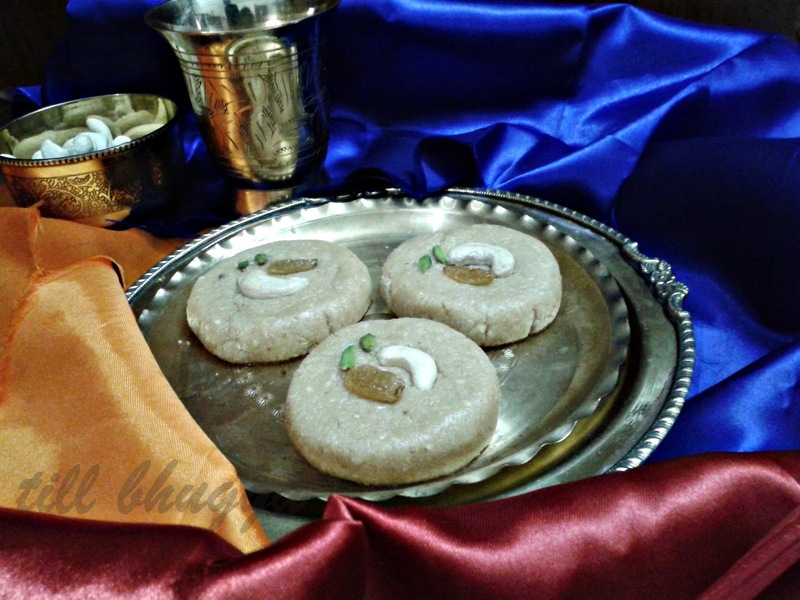 Khoa or khoya or khawa or mawa is dried whole milk or milk thickened made by heating milk in an open pan to condensation. If you don't get khoya then mix 1.5 cup of milk powder with 1 can or condensed milk (400 gms) and cook it in pure ghee or clarified butter . This mixture can be used in place of khoya. Take sugar and coffee in a bowl and gradually add water, first add 1 tsp water and mix it then another spoon and try to beat with the help of a spoon if you are not been able to beat it then add few more drops of water and beat it till it becomes frothy and changes color. The more you will beat it more frothy it will be. If required add few more drops of water while beating. 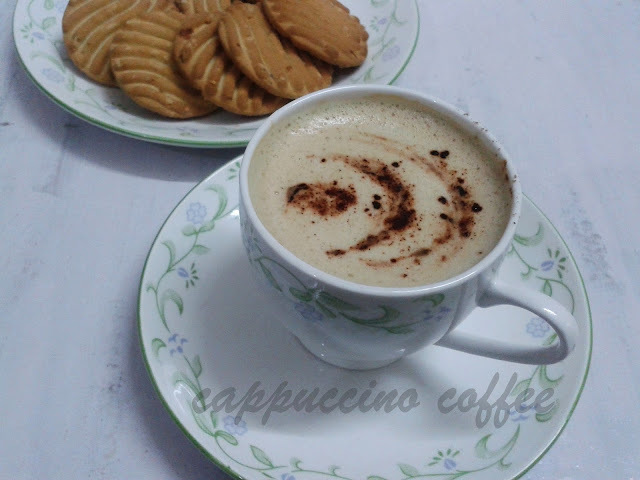 Put the beaten coffee in four mugs and pour milk over the coffee. Mix coffee with milk with a spoon. Sprinkle drinking chocolate and serve hot.